Toop&Toop Blog: Defection rocks real estate industry... wow! Defection rocks real estate industry... wow! On Wednesday 13 June, I awoke to texts, emails and calls asking if everything was alright. I initially assumed they were asking about my health! The first text came really early, I was still in bed. It was about an article in the paper. My first reaction was to check my iPad, which is always about half an arm length away and so I checked AdelaideNow. Great pic of a couple who had resigned from Toop&Toop the day before giving 3 weeks notice. I saw the headline and thought "interesting angle." OK… think I need to read this one in print. Wow!!! Page 3, 2/3 of a page, massive headline "Defection rocks real estate industry," and a sensational story (literally). 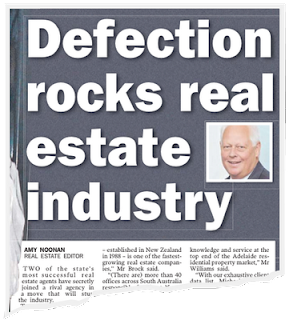 I had to chuckle, this article was so appropriate, from the first word “defection” in the headline right through to Mr Williams’ closing quote, "But we're not real estate snobs - we love selling - a $350,000 unit, a $400,000 house, of course we'll do it. We love what we do." Seriously, John and Stephanie leaving Toop&Toop “may” have rocked the industry, but it sure has made life easier for the whole team. Over the years we have brought people into the business and shown them the way we do things at Toop&Toop - some become ten foot tall and move on. These two never made it as top sales partner at Toop&Toop, they didn't stick around long enough. We have such a depth to the team, you have to be better than that to get the #1 gong at Toop&Toop. Real estate is about clients, about service, about compassion, about strong long term relationships, and working as a team, through thick and thin. It’s not about having a hot run for a few minutes and grabbing the cash. To succeed in this business you need staying power. You have to be a marathon runner, not a sprinter because real estate is a long term business. The depth of our team, the calibre of our core group and the proven results our team consistently achieve are way more important to our clients. Those who are strategic, considered, genuinely care about their clients and can pace their approach are the ones left standing when all the dust settles. So perhaps the defection did rock the real estate industry. But let me assure you, the only thing that rocked me was the fact that we could take people to a profile worthy of this article in 4 ½ years. That is quite an achievement. This is a special edition InsideStory. It’s for those talented and loyal Toop&Toop team members – they’re the real heroes – and I felt the real story needed to be heard; when the challenge is on, people's real characters are exposed. Toop&Toop simply get stronger every time we are faced with new challenges; history shows it. We not only have the stability, depth of experience and proven talent of our 27 years in business (such as Tim & Megan who celebrated 25 years working together with Sylvia and I Tuesday night) but we have the energy and excitement of a young team coming through. Even with 27 years under our belt, our passion and our drive have never been greater, and frankly we are at our best in tough conditions. So if you’re selling your property or renting it out, Toop&Toop is so much bigger than any individual, we are TEAM TOOP… and we do get results! After knowing and working with this pair of fraudsters (Williams'), I can only say "Good luck, Brock Harcourts....te he!" The reality distortion field that these two believe in can be mesmerizing for about two seconds to those of us that can see through the BS. 250 homes sold in four years... Yeah right!